CHICAGO 11/19, 11:30AM — Chicagoans from Rising Tide Chicago, Chicago’s League of Abolitionist Whites (CLAW), Lifted Voices and Showing Up for Racial Justice Chicago occupied a Chicago Citibank branch located at 2555 N Clark St. risking arrest to demand that funding for the Dakota Access Pipeline be stopped immediately. Over the last three months, thousands of Native Americans and allies have convened in Cannonball, ND to support the Standing Rock Sioux tribe as they resist the construction of the pipeline. Organizers delivered a letter and chanted while holding banners and signs inside the branch, interrupting business. Supporters outside the branch handed out fliers to passersby that explain how Citibank is profiting from the Dakota Access Pipeline and that the bank is putting profits before human life and the right to clean drinking water by bankrolling the construction costs. The Dakota Access pipeline will cross multiple water sources, such as the Missouri and Mississippi Rivers, transporting as many as 570,000 barrels of crude oil daily. 17 million Americans including 28 tribes depend on the Missouri River. This pipeline threatens drinking water and will contribute to global climate change. Energy Transfer Partners, the company that is building the Dakota Access pipeline, has bulldozed sacred burial sites in order to move forward with construction. Over the last six months, the indigenous-led resistance to the Dakota Access Pipeline has been attacked by security dogs, pepper sprayed, and shot with rubber bullets. Those occupying the Chicago Citibank at 2555 N Clark St. demanded that Citibank stop funding the Dakota Access Pipeline project in support of those on the front lines of the resistance. 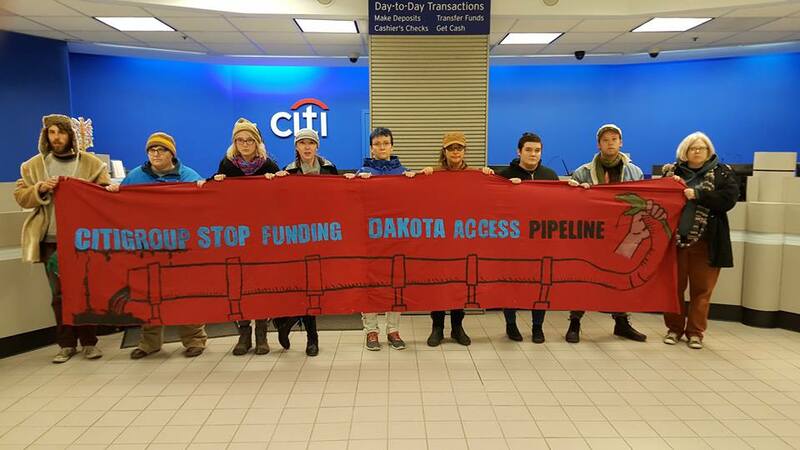 “Citibank’s funding of the pipeline directly contributes to the desecration of the sacred sites of the Standing Rock Sioux tribe,” said Rising Tide Chicago member Sean Estelle, who was arrested shutting down Citibank business. Energy Transfer Partners has justified the need to take land for the pipeline via eminent domain by saying that it would improve national energy security, but the network of pipelines will allow oil that has been obtained from a controversial practice that may cause earthquakes, hydraulic fracturing or “fracking.” The pipeline would allow this oil to be exported all over the world from the Bakken Oil patch in North Dakota. Organizers of today’s demonstration are calling on Citibank to stop funding the Dakota Access Pipeline because it will contribute greatly to the human misery and suffering caused by global climate change. Over 40 acts of civil disobedience in support of the NODAPL land protectors have taken place around the country. For more information on resistance to the Dakota Access pipeline, see: www.nodaplsolidarity.org. Follow #NoDAPLchi, #DivestFromDAPL, #Citibank and #NODAPL on Twitter to stay updated on today’s Chicago Citibank protest.